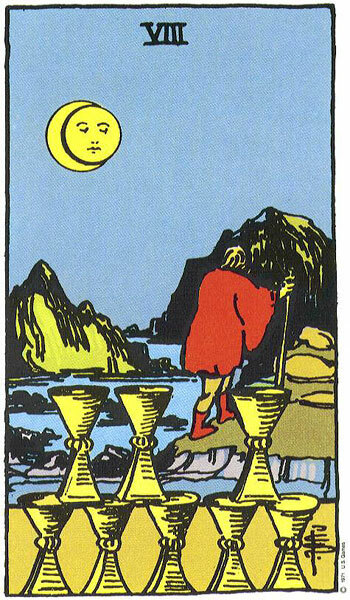 With the sun in Cancer (emotions and roots) and the moon in Scorpio (death or transformation), today is an Eight of Cups day. On a divinatory level, the Eight of Cups suggests the necessity of giving something up. Some sad truth must be faced about something or someone. No further action can be taken. We’ve run out of moves. For the Kabbalist, today’s energy is associated with Hod, the eighth sephira representing intellect and reasoning. Hod is also home to Mercury – the winged messenger god whose job it is to fly back and forth between heaven and earth carrying communications of every kind. But with the sun and moon both in water signs – we simply can’t expect Mercury do his best job wearing scuba gear. Hence on an Eight of Cups day we struggle to come to grips with our emotions. We find it impossible to understand why at some basic level we fail to be of good cheer. Perhaps it’s just existential angst and we hope that it is. But nonetheless we remain engulfed in an infinite and inexplicable sadness that we just can’t shake off – no matter how hard we try. Thus on an Eight of Cups day we come face to face with disillusionment – that something or someone has failed to live up to our ideals. Stuck in a muddy rut – we find ourselves angry yet impotent to implement change. No longer able to reason it all away, we must make a choice – either let go of that someone or something or let go of our dreams. What an interesting blog! I’ve been looking for something like this for over a year now! I’ll keep checking back on it! What Astronomy books would you recommend to start understanding all this? HI there – and thanks for the compliment! RE: starting out in astrology – if you like the psychological approach to astrology then read anything and everything by Liz Greene (American Jungian analyst who studied psychology because she loved astrology and not the other way around) – also check out her school in London (http://www.cpalondon.com/) and her commercial website has some great info too (http://www.astro.com/). She’s published a good many books all easy to read – it will take some time to sort out the various ideas – but keep reading and it becomes clear – also play with charts – lots of them – all friends and family are subjects of your study. I ‘ll be happy to answer questions too. I love astrology – it’s my preferred language with which to engage with the world.